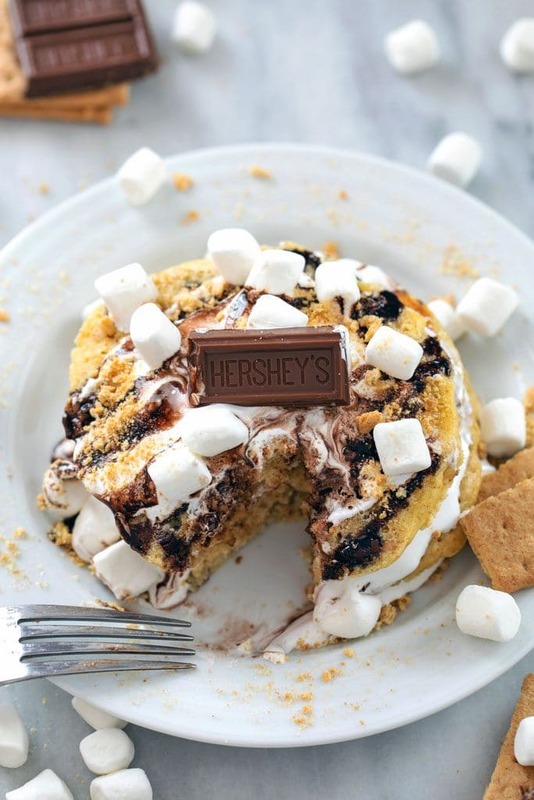 Whether you need a little Sunday brunch indulgence or are taking breakfast for dinner to new levels, these S’mores Pancakes packed with graham cracker flavor, homemade marshmallow fluff, and chocolate sauce are sure to make your whole family happy. 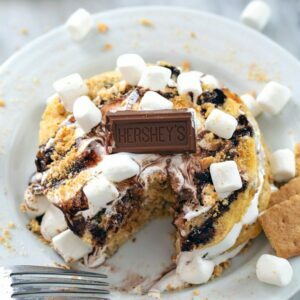 (This recipe for S’mores Pancakes was originally posted in June 2011, but was updated with new photos in 2018). Bad day? Week? Month? Life? I’ve got the cure. Really, all you need is to have had a bad minute to justify eating chocolate and marshmallow fluff for dinner. Because that’s essentially what this is. You’re probably better off eating it for a Sunday afternoon brunch after a rough Saturday night, when indulgences are always excused. But I had it for dinner. And I refuse to feel bad. So there. If you know me, you know I have a special place in my heart for s’mores. I think it’s one of the best flavor combinations in the world and I would love to recreate those flavors a million different ways. When the idea of s’mores pancakes crossed my mind, I realized it could be pretty perfect. Graham cracker pancakes, marshmallow fluff, and chocolate sauce. Simple, yet beyond satisfying. I made my own marshmallow fluff for this recipe because a) it’s the easiest thing ever and b) store-bought Fluff scares me. I’m totally going to be one of those moms who lets their kids eat junk food, but only if it’s junk food I make myself. They’ll be like “mommy, can I have an Oreo cookie?” And I’ll be all, “Sure, honey; just give me an hour in the kitchen and your Oreo cookie will be ready.” But at least we’ll always have marshmallow fluff in the refrigerator. Yes, refrigerator because it doesn’t have all those shelf-stable preservatives that the store-bought stuff has. Because I’ve made marshmallows before, I knew I could make fluff. Because really, all marshmallows are are fluff with gelatin. Making the fluff is a lot easier and less messy than going all the way with the marshmallow (you know what I mean). Literally, all you do is beat together egg whites, corn syrup, and salt on high speed for 4-5 minutes until it thickens up. It will turn white and be looking quite like fluff. Then just mix in the confectioners’ sugar, vanilla, and cream of tarter and your homemade fluff is done! The pancakes are also quite easy to make. What sets s’mores pancakes apart from regular pancakes is that they’re made with graham cracker crumbs. Gotta get that graham cracker flavor in when it comes to all things s’mores, right? They also involve chocolate chips because there is no such thing as too much chocolate when it comes to s’mores. 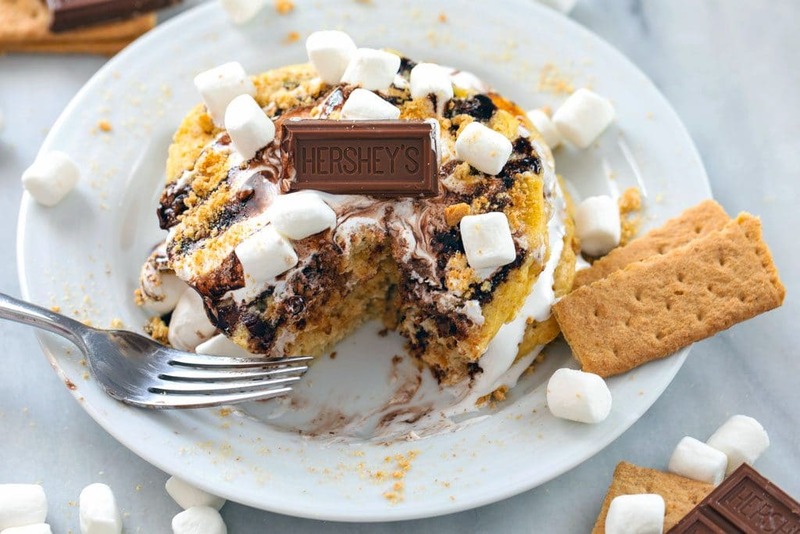 The most important part of these s’mores pancakes is assembling them. Feel free to do this however you want, but here’s my recommendation.Start by placing one pancake on a plate and spooning about 2-3 Tbsp fluff on top. Remember the fluff will spread and ooze, so try your best not to over-do it here. If you’re feeling really crazy (which clearly I was), garnish the whole shebang with mini marshmallows and more Hershey Bar pieces (pips, if you will). Oh, and some graham cracker crumbs, for good measure. I think Chris thought I was crazy for serving graham cracker pancakes covered in marshmallow and chocolate for dinner, but he didn’t try to stop me. We’ve both had rough weeks, we haven’t been able to get to the grocery store, and a little chocolate and fluff has never hurt a soul. If anything, it helped us. In fact, I think we’re both a little happier this morning. And when I saw Chris take a bite of the Hershey’s chocolate bar I left on the plate for decoration, I knew I was totally justified in my dinner choice. There is never enough chocolate. Make s’mores pancakes for brunch or dinner or simply for the best afternoon snack ever. They’ll cure a bad day or simply a bad second and make you feel like a kid again. Bonus points for the fact that you don’t even need a campfire or marshmallow roasting stick to make them. But don’t blame me if your family gives you weird looks. Something tells me they’ll end up loving you even more than before after taking just one bite. Speaking of roasting marshmallows, have you ever seen this video of Martha Stewart making marshmallow roasting sticks? Watch it. It’s fantastically wonderful. What’s your favorite not-really-dinner meal to have for dinner? If you’re looking for more s’mores recipes, check out my S’mores Pavlova, Bourbon S’mores Milkshake, or one of my many other s’mores recipes! 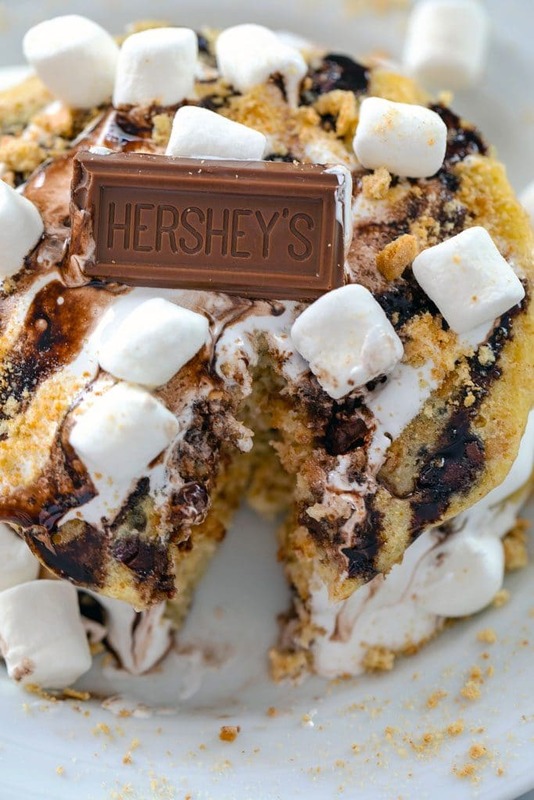 Whether you need a little Sunday brunch indulgence or are taking breakfast for dinner to new levels, these S'mores Pancakes packed with graham cracker flavor, homemade marshmallow fluff, and chocolate sauce are sure to make your whole family happy. In a large bowl, whisk together flour, sugar, baking powder, salt, and graham cracker crumbs until well combined. Add whisked egg, melted butter, and milk into the flour mixture and mix until blended. Fold in chocolate chips. Break chocolate bar up and put in a double broiler (or in a saucepan over another saucepan of boiling water) and stir it until melted. 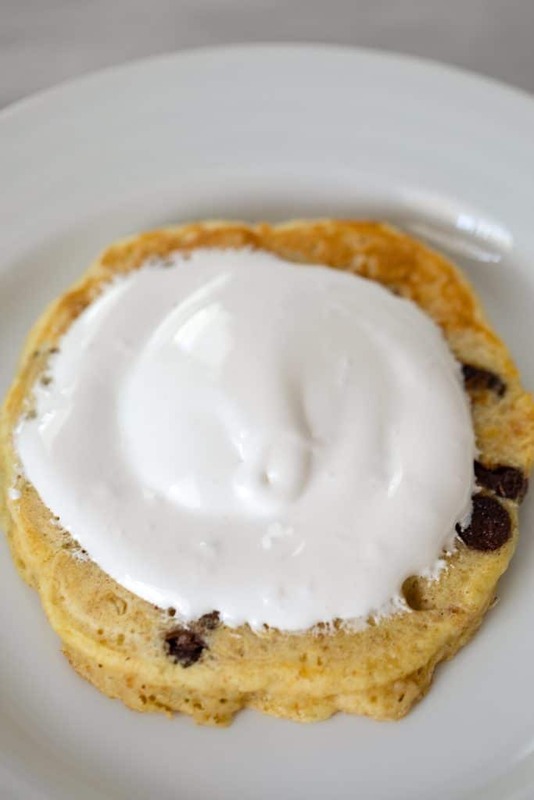 To assemble: Spread about 2-3 Tbsp of marshmallow fluff on a pancake. 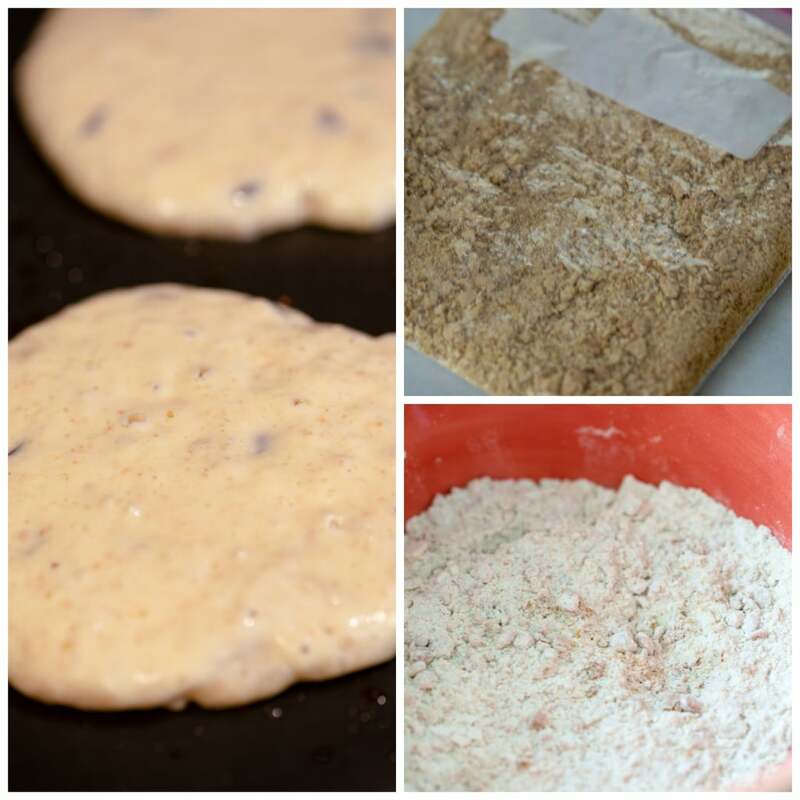 Place a pancake on top and spread with another 2-3 Tbsp fluff. Repeat with a third pancake and then top with additional marshmallow fluff and melted chocolate. Feel free to add garnishes like mini marshmallows, additional pips of chocolate, and graham cracker crumbs. Enjoy! 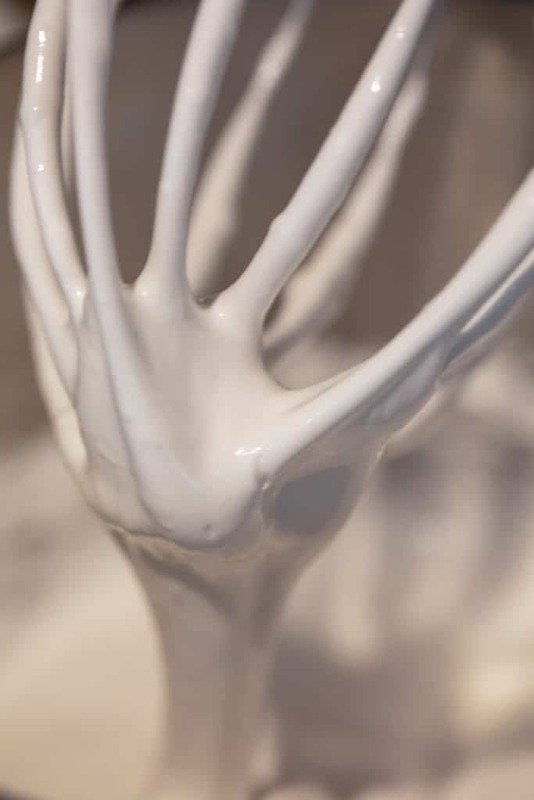 In the bowl of a stand mixer or in a large bowl with a hand mixer, beat egg whites, corn syrup, and salt on high speed for 4-5 minutes until mixture thickens quite a bit. The mixture will have started clear, but after beating, it will turn bright white. Beat in confectioners' sugar, vanilla, and cream of tartar on low speed, until combined. You won't need the whole batch of fluff for these pancakes (unless you get really crazy! ), but it will keep in your fridge for about 10 days and makes for amazing peanut butter and fluff sandwiches! 37 Responses to "S’mores Pancakes"
I am very impressed you made your own fluff. what a fun dinner. sounds like you will be the coolest mom ever. the kids will have to understand the wait will be well worth it! This is really cool/clever/lovely! Yum!! making your own fluff? I’d happily have a bad day more often if I had homemade fluff to make it all better. I’ve never been so turned on by a pancake in my life. Ummm. Yes. I will take a stack of these, please ;). Every now and then I’ll have a sweet dessert-y breakfast for dinner, and every time I do I ask myself why I don’t do so more often! omg you are so right, this would make any bad day or week better! I need to go make homemade fluffernutter asap and then these pancakes, yum! ohmahgah, i want. the problem with fluff (or homemade marshmallow goo) is that i eat way too much of it in one sitting. like, all of it. so, i don’t really trust myself around it. however, i may need to make these because they look so.darn.good. Oh wow. These might have to be a “must make soon”. This is a great idea – something I want to do with my nephews for sure. Love the homemade fluff most of all – I can myself licking it out of the batter! oh my goooodness! i need a stack of these after this week. Actually, the video was really funny! My sweet tooth is fully activated after reading this post! I love that you had these for DINNER!!! Love this recipe! smartest permutation of a s’more i’ve seen yet. must try. as soon as i can talk myself into the decadence. You are amazing! Give me a stack of those right now. Yum! How indulgent and fun do these sound. Love it! My kids would LOVE these. I’m thinking I would make a chocolate sauce in a runny sort of way and then add chocolate chips to top the whole thing off. I might also go on a limb and add bananas to the pancake batter. The homeade fluff I have to try. That is one huge honking bottle of vanilla! This is the best thing I have seen in my entire life, I can’t wait to make these. So I finally made these and told everyone I knew about these. Literally everyone I saw I told them about these pancakes. I love the homemade fluff – I had no idea how simple it was. One little change I made to this was bacon! I crumbled bacon on top and wowza. Technically no longer a s’more at that point but techincally everything with bacon is awesome. Oh my dear lord!!!! I am seriously about to go to the store right now to get the few more things i need to make this!!! Ha, I can’t believe how excited I just got over this. Can’t wait to make these for the boys for breakfast in the morning lol Thank you! These look so delicious! I love all the ways s’mores are being utilized and reformed. So fun and so yummy!! These pancakes look so perfect! I wish I had a stack of those right now!